Tornadoes are rated by the havoc they inflict, on a scale of 1 to 5. But to fully comprehend this scale, you have to see the aftermath. After a tornado is reported, the National Weather Service deploys storm survey teams to analyze the damage. The teams analyze the damage and calculate the wind speeds necessary for the destruction. The lowest tornado rating, EF-0, is reserved for minor damage. 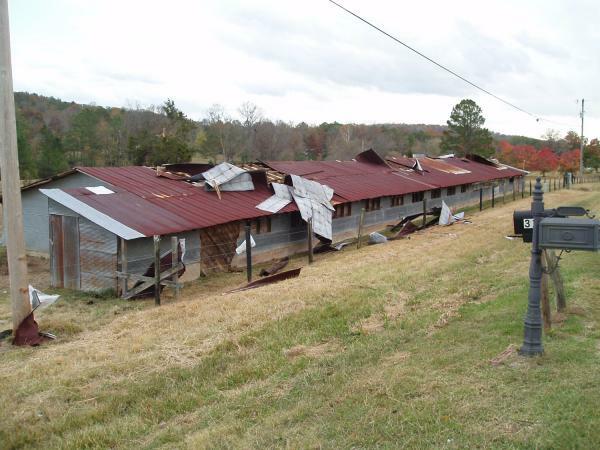 Above, an EF-0 tornado peeled back parts of the roof on a chicken barn in Ringgold, Georgia. 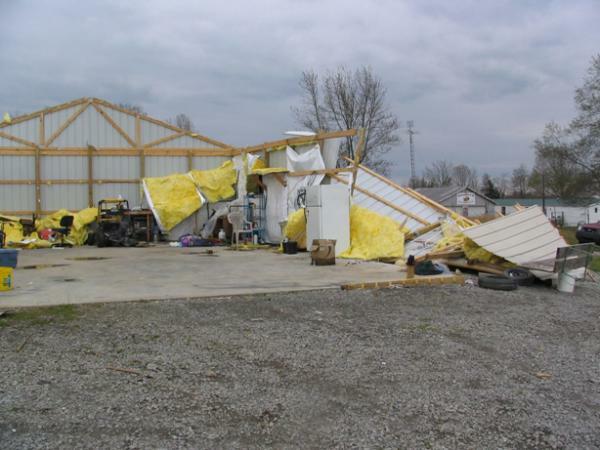 EF-0 twisters can destroy small, poorly built structures, like the garage pictured below. These weak tornadoes usually cause only light damage to well-built homes. They may peel back gutters or siding, snap branches or uproot shallow-rooted trees. 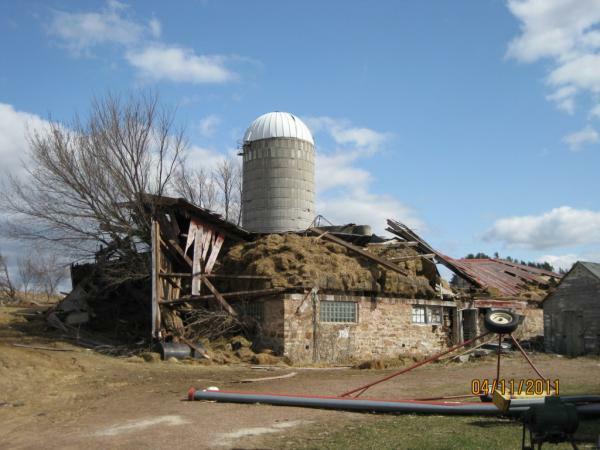 Twisters of the second-lowest rating can still wreck smaller structures, like the barn pictured above. 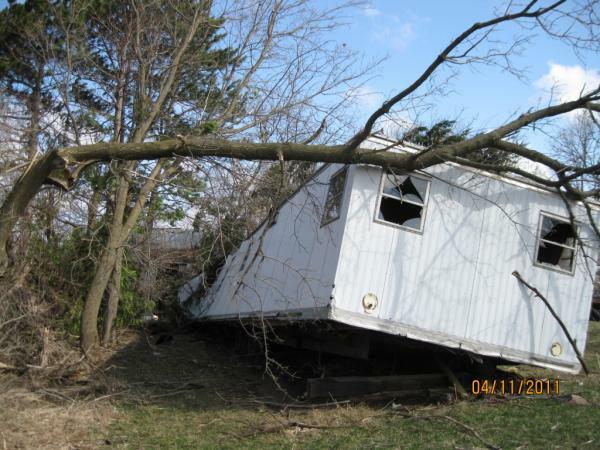 Typically, EF-1 twisters strip away roofs, flip mobile homes, blow off doors and shatter windows. 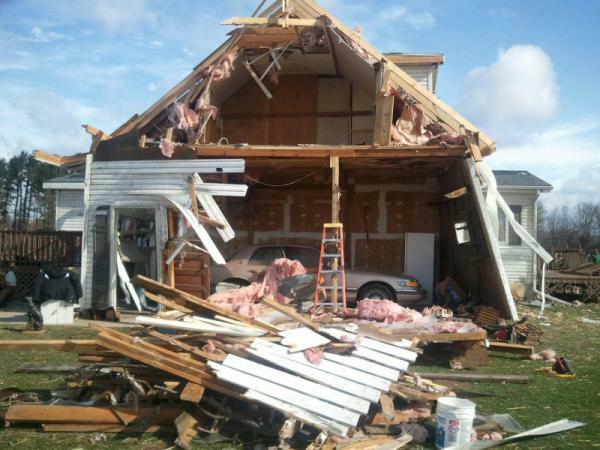 Smaller twisters like EF-1 tornadoes can still be deadly. It doesn't take much to flip over a mobile home, and these manufactured homes become death traps during tornadoes. Trees can crash through them or the homes can roll and pin people underneath. The widespread use of manufactured homes in Dixie Alley, the name for the tornado-prone Southeast United States, is one reason that the region has a high number of tornado-related deaths. EF-2 tornadoes are when things get serious. These strong storms can tear the roof off a house, shift a house's foundation, snap large trees, lift cars off the ground and shoot boards like missiles. An EF-3 tornado is strong enough to destroy entire stories of well-constructed houses, knock over trains, rip the bark from trees and toss heavy cars. North Carolina's capital was recently hit with an EF-3 tornado. The twister ripped through 63 miles (101 kilometers) of Raleigh, killing five people. 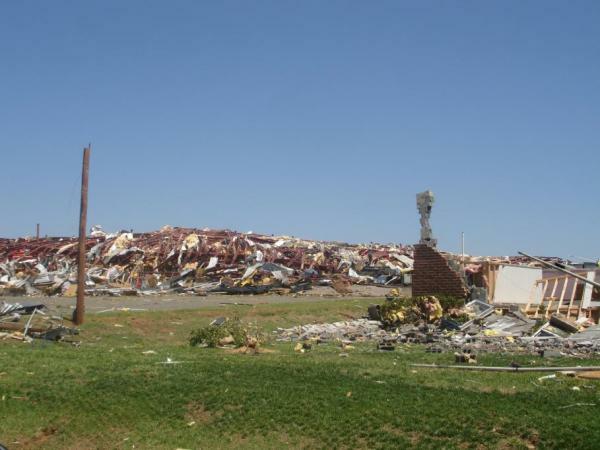 The strong storm leveled a warehouse, leaving behind a pile of rubble. EF-4 tornadoes are strong enough to level sturdy houses, and rocket cars and other large objects. 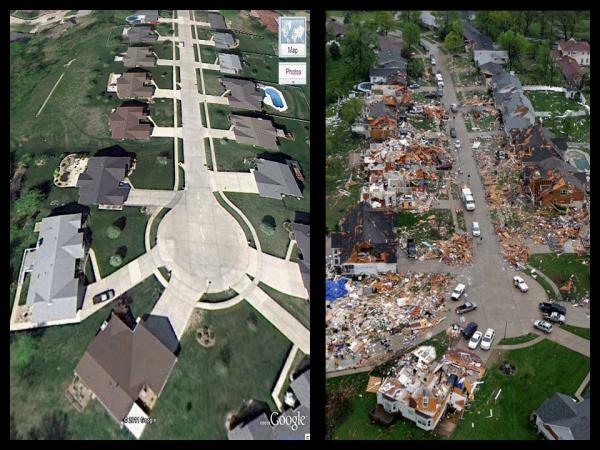 On April 22, an EF-4 tornado hit the St. Louis area, leaving destroyed houses in its wake. The 2011 St. Louis EF-4 tornado traveled 22 miles (35 kilometers). As it strengthened, it shredded the roof of a crowded airport terminal. Remarkably, no one was killed by the massive twister. EF-5 tornadoes are the most powerful, and thankfully, the least common. These twisters are strong enough to blow away big houses and collapse tall buildings. 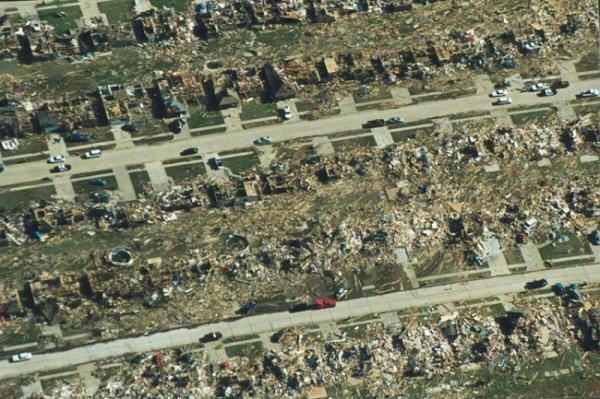 On May 3, 1999, an EF-5 tornado brought near total devastation to Moore, Oklahoma. Forecasters and researchers use a wind damage scale created by T. Theodore Fujita to classify tornadoes and sometimes the damage done by other wind storms. The F - for Fujita - scale uses numbers from 0 through 5. The ratings are based on the amount and type of wind damage. F-6 or higher rated tornadoes aren't thought to exist. The damage they would do would be "inconceivable." Dr. Fujita's goals in his research in developing the F-Scale were categorize each tornado by its intensity and its area estimate a wind speed associated with the damage caused by the tornado. Dr. Fujita and his staff showed the value of the scale's application by surveying every tornado from the Super Outbreak of April 3-4, 1974. The F-Scale then became the mainstay to define every tornado that has occurred in the United States. The F-Scale also became the heart of the tornado database that contains a record of every tornado in the United States since 1950. The Fujita Scale is a well known scale that uses damage caused by a tornado and relates the damage to the fastest 1/4-mile wind at the height of a damaged structure. Fujita's scale was designed to connect smoothly the Beaufort Scale (B) with the speed of sound atmospheric scale, or Mach speed (M). Fujita explains explicitly that "F-scale winds are estimated from structural and/or tree damage, the estimated wind speed applies to the height of the apparent damage above the ground." 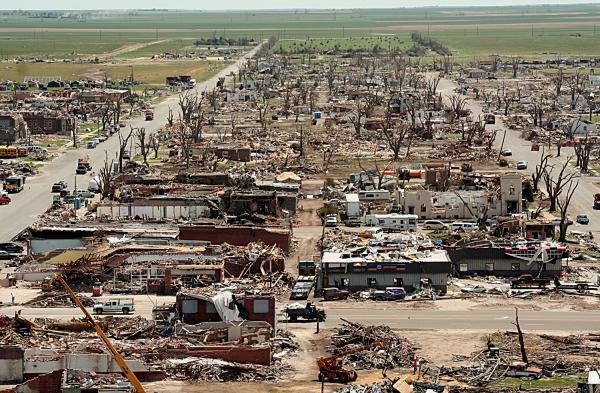 if the 3/4-mile wide tornado does not hit any structures, what F-scale should be assigned? Fujita recognized that improvement was necessary. He published his memoirs called Mystery of Severe Storms in 1992 updating the Fujita Tornado Scale to include an estimate of f-scale damage then selecting the F-scale as a combination of f-scales and types of structural damage. When using the EF-Scale to determine the tornado's EF-rating, begin with the 28 Damage Indicators. Each one of these indicators have a description of the typical construction for that category of indicator. Then, the next step is to find the Degree of Damage (DOD). Each DOD in each category is given and expected estimate of wind speed, a lower bound of wind speed and an upper bound of wind speed. Let's take the earlier example, a tornado moves through a neighborhood and walls are knocked down of an area of homes. Here the Damage indicator would be #2, One or Two Family Residences (FR12). The typical construction for this fits being a brick veneer siding home. The DOD would be a 8, most walls collapsed in bottom floor. Thus, the estimated winds would be 127 - 178 mph with the expected wind speed of 152 mph. Now, taking this number to the EF-Scale, the damage would be rated EF-3 with winds between 136 - 165 mph.